The world’s most popular match-3 puzzle RPG meets one of the world’s most-played trading card game. Developed by Hibernum Creations, Magic The Gathering: Puzzle Quest combines card battle with match-3 elements pretty well and provides an impressive game full of spells, creatures and your favorite Planeswalkers. A mini-tutorial explains the bare basics and opens the door to the world of magic. Players can then devise their own strategies and build a powerful deck to defeat opponents in the story and PvP battle mode. There’s an element of luck and randomness because of match-3 elements introduced to a card battle game, but players can take advantage of them if they know how to make the most of cards, Planeswalkers and mana gems. These quick tips and strategies will help them in knowing their cards, unlock their secrets and use them to get an edge in battle. Attacker Cards: Summon them to directly hit your opponent’s Planeswalker or his defender cards. Key attributes of an attacker card is Power (attack rate) and Toughness (Defense). Summon an attacker that has good attack/defense rate. Look for a card with 4/4 attributes. Having such a card at the top of your hand can be a good strategy to defeat your opponent. It won’t be defeated easily by Berserker cards and will reduce more HP from your opponent Planeswalker’s total HP. Having a card with 4/4 attributes followed by 2/2 cards can be a strong attack lineup against your opponent. Some attacker cards have low mana requirement and a good attack rate. They can be summoned easily. Look for attackers with 2/2 attributes and cost less than 10 mana. Defender Cards: They will defend your Planeswalker against attacker cards. With a defender card summoned, attacker cards will start attacking it instead of your hero. Defender cards will act as a shield against attacks. If your hand contains a defender and an attacker card, have the defender card at the top, followed by a strong attacker card. The defender card will not only defend your Planeswalker but also attack its attacker. However, Flying creature cards will bypass their shield and attack your hero. Berserker Cards: You can use Berserker cards to attack strong attacker cards and reduce their HP. A card with a “berserker” icon can be a great addition to your hand. An attacker card won’t attack it when your opponent’s turn comes. Use it to reduce the number of summoned cards in your opponent’s battlefield. Support cards can help you defeat your opponent in a unique way. You can call them “passive” cards. When a support card fills up, it lands up on your game board. They possess a random gem on the game board, making its appearance look different from the others. A gem possessed by a support card glows and has a number on it. This number is actually the number of matches it can resist before it disappears. A support card gem can be matched and with each match its number will be reduced and once it hits zero, it will disappear from the game board. So if a support gem has “2” on it, the gem will last only 2 matches before disappearing. If your opponent has a support gem on the game board, try to match it with same-colored gems whenever you get an opportunity. This will reduce its number and once the count reaches zero, it will disappear. Your opponent will also try to match gems with your support gem. Try to get rid of same colored gems close to support gems to discourage your opponent from making any matches with it. If the AI draws an attacking support card from your deck, make sure you promote it at the top of your hand below your attack card(s). The Meteorite is one example of an attacking support card. When it enters the game board, it deals 2 damage to your opponent’s first creature card. Also, you gain 1 mana at the start of your turn. Some support cards grant extra stats to your creatures attack and toughness attributes, making the card more powerful. The Veteran’s Sidearm is example. With this support card on the game board, your first creature gains 1 attack and 1 toughness. There are several support cards and each has its own unique properties. Make the most of them and make sure your opponent does not match same-colored gems with your support gem to reduce its number. In Magic: Puzzle Quest, matches of 3 or more same-colored gems fills cards in your hand. Each card requires a certain number of mana before it can be completely filled up and summoned into the battlefield. To check your card’s mana requirement, open your hand by swiping right. You will see a number at the top-right corner of each card. It shows the number of mana required to fill it up. The mana count of a card reduces with each same-color gem match. Reduce the total mana count to zero to fill up the card and summon/cast it into the battlefield. The Conclave Naturalists card requires 11 Mana. Each gem in a match reduces the total mana count by one and once the count hits zero, the card fills up completely and is summoned into the battlefield. So if you match 3 gems of the same color, the total count will hit 8 (11-3), filling some part of your card. Keep matching to bring the total count down to zero. This is when the card fills up completely and is summoned into the battlefield. However, there’s a catch. Based on your Planeswalker’s main color, similar-colored gems give bonus mana. So if your chosen Planeswalker is Nissa, then matching 3 or more green gems will grant an extra mana because green is her strong mana color. If you match 4 green gems, you have actually matched 5 gems because of the extra mana you received as color affiliation bonus. This will bring the total mana down to 6 (11-5). Matching gems that belong to the main color of your Planeswalker will help reduce a card’s total mana much faster, thereby filling the card quicker than expected. This will help you summon your creature cards, cast a spell or use support cards faster than your opponent. Some gems have a negative mana associated with them, which can delay the card filling process. If you match three black gems, the total count will reduce to 9 (11-2) and not 8 because black, being Nissa’s weak color, has a negative number associated with it. 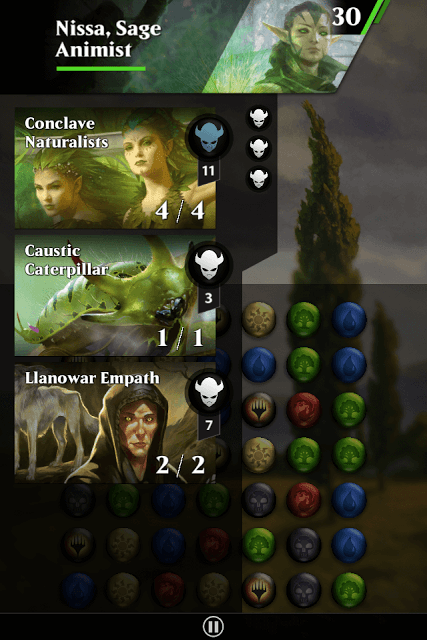 You can check your Planeswalker’s weak and strong mana gems by tapping on his/her portrait. The list of gems and the bonus mana they give can be seen at the bottom a Planeswalker’s info screen. There are some creature cards with low mana count but good attack/toughness stats. Drag them to the top part of your hand. Creature cards having stats 2/2 can come quite handy and usually have a low mana count. They can be summoned faster. Each Planeswalker has a unique color which can be seen below his/her portrait. Matching gems that belong to a Planeswalker’s unique color will grant a mana bonus and fill the card faster. You can then summon cards much faster than your opponent. For example: Nissa has a mastery over the nature element, denoted by the color green so green gem matches will give extra mana to the first card in your hand, making it fill quicker. 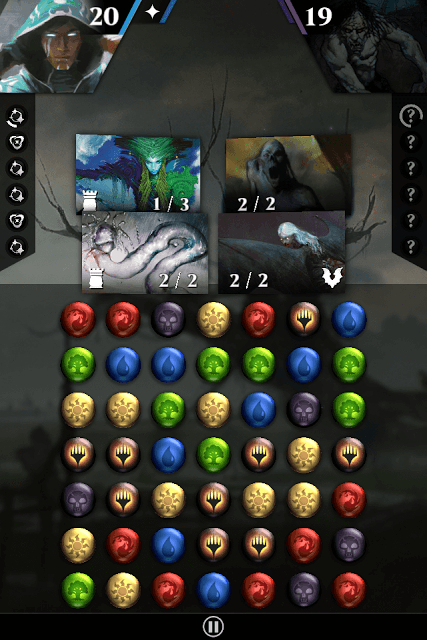 You can tap on your Planeswalker portrait to check which mana gems grant bonus and which do not grant any. Also note down those gems that reduce mana once matched with a same-color gem. 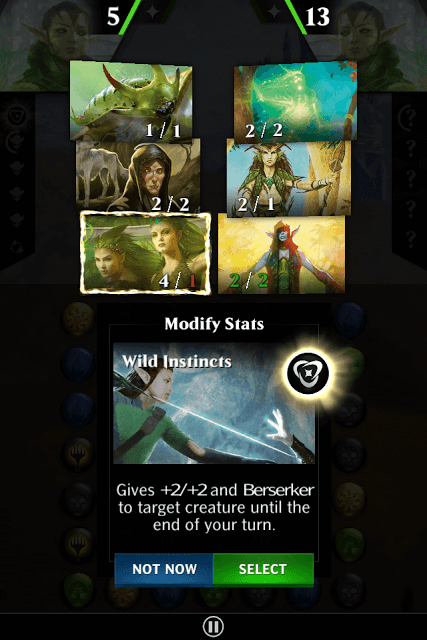 For example: Nissa’s weaknesses are Blue and Black so matching same-color “weak” blue or black gems will subtract 1 mana from the card and it won’t fill as fast as it would have been with a stronger mana gem. In several occasions, the game board will be dominated by “weak” or neutral gems, i.e. those gems that do not give any mana bonuses. But that does not mean they won’t fill your card after matching them. If the number of “weak” gems in a match is higher, it will offset the negative effect on your card to some extent and will still fill it. Do remember that the game board throws a number of random gems at you and it will be tough to find gems that give mana bonuses, so don’t ignore or be disappointed when you see the game board filled with weak or neutral gems. They can fill your card easily if they are in large numbers. Look for a match that contains more of such gems to get rid of them in one move. Your priority is to look for stronger gems, i.e. gems that belong to your Planeswalker’s dominant color, and match them. If you don’t find any, then look for neutral gems, i.e. those that give 0 bonuses or no bonus at all. Try to match more neutral gems of the same color. They will still fill your card, but won’t grant any extra mana. If the game board has too many “weak” gems and you can’t find any neutral or strong mana gem matches, then you have no choice but to match them. And if all such gems are close to each other, then you are lucky. Try to get rid of weak gems to make way for new gems, which will fall from the top of the game board as more and more gems are matched. The booster pack that you have purchased from “Vault” will contain a few cards that you can be added to your deck. With Quick Improvements selected, you don’t have to manually choose cards that you want to replace with booster pack cards. The AI does that for you and will intelligently choose the card that should be replaced with the newer one. To access Quick Improvements, tap on menu and then tap on Planeswalkers on your home screen. Any new card added to your inventory will be shown under Quick Improvements. If you want to manually edit your deck, then make sure the card you choose has the same color as your Planeswalker’s main color. Other color-coded cards won’t fit your deck. Also, your deck should contain 7 unique creature cards, 2 unique spell cards and 1 unique support card. Choose the best creature cards. You can have more attack cards, at least one or two Defender card and one Berserker cards. Select a support card that can deal damage to your opponent or grants extra stats to your creature cards. You can find all support cards that you have collected so far in your inventory. 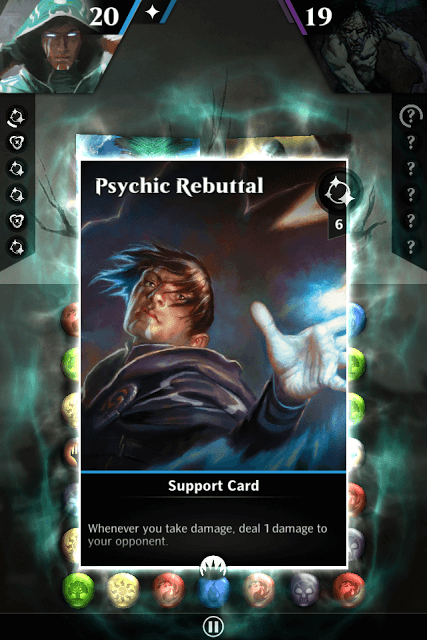 Filter your cards by type and tap on the support icon to see a list of support cards you currently have. Each spell card can play an important role, but you should give preference to those that have max impact in a card battle. Choose a spell card that gives your target power extra stats. “Wild Instincts”, for example, gives +2/+2 and Berserker type to a selected card placed on the battlefield. Another such card is “Titan’s Strength” that gives target card +3/+1. Have such spell cards at the top of your hand, but make sure you have one or two creature card placed on the battlefield before using them as they require a player to select a creature card. There are also some spell cards that can move a target creature card back to its owner’s hands and draw a card from your hand. Anchor to The Ether is one such card. You don’t have to use Nissa every time you battle an opponent; there are other Planeswalkers available at the Vault. Currently, you can purchase a Planeswalker for 10 mana crystals. Before purchasing one, tap on the info icon at the bottom of the portrait to know more about a Planeswalker. Each Planeswalker will have its own deck of cards and unique abilities. Choose one whose first ability is better than others. Chandra, Roaring Flame’s and Jace, Telepath Unbound’s first abilities are pretty solid, but their HP is low if compared to Gideon. But then you can easily increase the total health cap by leveling up your Planeswalker using Runes, which can be earned after completing a battle or as daily rewards. The first ability of any Planeswalker can be easily unlocked, so better choose a card whose first ability has more impact in battle. Start playing with Nissa and once you are confident with your card battling and match-3 skills, purchase a Planeswalker. Make sure you level up your new Planeswalker with Runes before playing him/her in a mission. Matching Planeswalker gems will help you gather loyalty, which will charge your hero’s abilities, not cards. Once his ability is charged, your Planeswalker’s portrait will glow. Tap on his portrait and then tap on the charged ability to activate it. Each ability has a match requirement. Match 3 Planeswalker gems to get 3 loyalty points and charge the first ability. Match a total of 9 Planeswalker gems to get more loyalty points, which will help you charge the second ability (when unlocked) and so on. You can use an ability in each turn. If you have two abilities unlocked, then try matching more gems to get more loyalty points, which will charge the second, and a much stronger ability. After a battle is over, you can heal your Planeswalker’s health using potions. There are a total of 5 potions, which are refilled automatically after some time. Alternatively, you can use runes to level up your hero. Leveling up will not only refill HP points but also increase the total Health cap by a few extra points. Play story missions and complete objectives in each mission to get more runes and mana crystals. Before starting a story-based card battle, check its objectives. You will receive guaranteed runes if you win the fight, but you can also get additional rewards such as mana crystals by completing secondary objectives. You may replay a card battle to complete such objectives. Magic The Gathering: Puzzle Quest’s story mode can be a good way to practice and hone your card battling skills. When you are ready, you can battle random players in PvP Quick Battle. Before battling players, have the best cards in your deck. The AI will randomly choose a card from your deck and move it to your hand in each turn.